For over 20 years, Santa Fe Community Yoga Center has provided affordable, high-quality yoga and holistic healing to the people of Santa Fe. With over 55 weekly offerings in our two beautiful studios, we have a wide selection of yoga styles and levels. We have at least one donation-based class open to the public each day, as well as some of the only Prenatal/Postpartum yoga classes in town (which will always be donation-based). Our classes offer a safe and comfortable space to explore both the general aspects of yoga and the more subtle energies that exist within the practice of yoga. We are a 501(c)(3) organization and depend on the financial support of our students and our community. If you would like to support our center and its mission, please visit our Support Us page! All donations are tax-deductible. We also happily accept non-monetary forms of support. Lara Bache has been teaching and studying yoga since 2009, but her love of meditation and the contemplative traditions have been with her since childhood. Lara received her BA in Critical Theory and Social Justice from Occidental College and graduated with honors in 2010. She has been co-director of the studio since 2014. 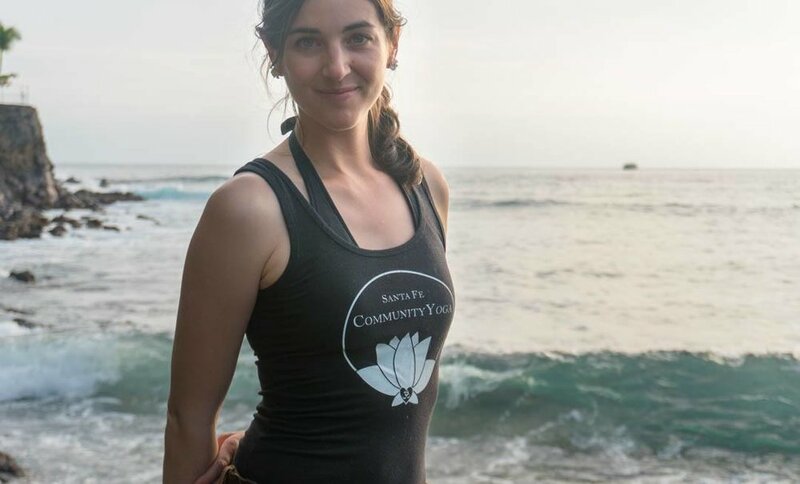 Outside of the studio, she enjoys writing and reading poetry, having spontaneous adventures, Tibetan thangka painting, living in the woods, and taking long hikes with great friends. Michael was a well-known and loved leader, healer, teacher and creator of community in Santa Fe. Michael passionately believed in being of service to mankind and in the power of community to enhance and enrich the lives of all. His dedication to a life of service and spiritual leadership was inspired by his great yoga teacher, Sri Swami Satchidananda, who gave him the name Maitreya meaning "friend to all" as they stood together on the banks of the Ganges River. A 14-month pilgrimage around the world, including nine months in India, brought him back to Santa Fe in 1995 to create and direct the Santa Fe Community Yoga Center. Michael was passionate about creating a healthy community for men. He led the 14th annual New Mexico Men's Wellness Conference at Ghost Ranch Conference Center in 1998, choosing for its theme, "Healing the Healer Within." The conference continues to provide the opportunity for men to gather, sharestories andfeelings, hear each others' wisdom, explore new realms of personal growth, and deepen relationships with other men in a safe, supportive environment. For many years Michael organized an annual gathering, entitled Man2Man, which brought together gay and straight men in order to promote mutual understanding and support. Michael was also deeply concerned with reconciliation between men and women, receiving training in gender reconciliation during 2002 and 2003 in Boulder, CO. He brought that work to Santa Fe where he offered gender reconciliation workshops through the Community Yoga Center. Michael's community involvement included service on the Interfaith Council. He was the moving force behind the labyrinths built at Frenchy's Field and the Santa Fe Community Yoga Center, created community among the yoga studios of Santa Fe, taught yoga and meditation within the prison system of New Mexico and promoted tolerance and understanding among all fellow beings. Michael Maitreya Hopp passed on Christmas morning 2004 while visiting his family in Redwing, Minnesota. Michael, his partner Jane Prouty, and his nephew, Nathan Schmidt were victims of a carbon-monoxide accident. Michael's work lives on with the continuation of the Santa Fe Community Yoga Center and the Yoga in Schools program. Heart Mountain Prison Project continues to bring yoga and meditation to those incarcerated in New Mexico. His spirit lives within the hearts of all those he touched.